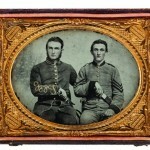 Civil War-era photos and paintings come to the Met just in time for the 150th anniversary of the Battle of Gettysburg. 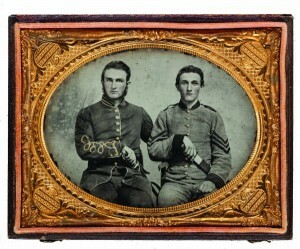 Captain Charles A. and Sergeant John M. Hawkins, Company E, “Tom Cobb Infantry,” Thirty-eighth Regiment, Georgia Volunteer Infantry, 1861–62, quarter-plate ambrotype with applied color. Thomas Moran, Slave Hunt, Dismal Swamp, Virginia, 1862, oil on canvas. In 1933 the Metropolitan Museum of Art acquired 418 Civil War-related photographs from the Massachusetts division of the Military Order of the Loyal Legion of the United States, an organization formed in 1868. The collection was largely attributed to famed war photographer Mathew Brady, the figure who—often given his own chapter in high school American-history books—is considered to be the father of American photojournalism. Brady apparently had more of a managerial role than an artistic or journalistic one—he had photographers sent out to all corners of the war, and from his headquarters in Washington published these collected works under his name. From this collection, the museum will display 13 photographs in its exhibition “Photography and the Civil War” (through September 2). Thirty-two photographs appear in the show from the museum’s 2005 acquisition of the Gilman Paper Company’s celebrated collection, which contained a pristine copy of the two-volume 1866 photographic anthology—America’s first—Gardner’s Photographic Sketch Book of the War. Along with loans from major public and private collections and George N. Bernard’s Photographic Views of Sherman’s Campaign, also from 1866 (acquired by the Met in 1970), the museum has staged an 11-gallery exhibition with over 200 pieces—daguerreotypes, ambrotypes, tintypes, and others—by “approximately four dozen named individual photographers and photographic studios, and countless unknown artists,” as the museum puts it, depicting a conflict that spanned four years and caused the death of 75,000 Americans. As the war began, photography was celebrating its 20th birthday, but it hadn’t matured sufficiently to be able to capture fighting in action. As a result, the Met’s exhibition is mainly two things—a wall-mounted yearbook of soldiers’ portraits, some named and some anonymous, and a chronicle of death, gore, bodily decay and ruination caught by the lens after the conclusion of battle. This is not a celebration of history, and it will not make the viewer feel proud of the country’s past. This is a pageant of horrors. It is, however, if one can think past the graphic nature of its imagery, a meaningful and evocative exhibition of American photography. 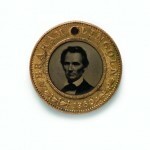 Brady’s famous 1860 portrait of Abraham Lincoln appears in the show, as well as a tintype reproduced in a medal by an unknown maker that shows Lincoln’s face reversed in the portrait. The maker is thought to have produced these medals with Lincoln’s carte de visite for mass distribution or sale by the Republican Party. In the image, Lincoln looks solemn but youthful. The exhibition does not provide a war-worn image of the President after fighting’s end, however—viewers will have to look for the punctuation mark at the end of that sentence in the images devoted to the president’s assassination in the exhibition’s final gallery. Among these, the viewer will find the first wanted poster to utilize photographic imagery, issued on April 20, 1865, and calling for the capture of John Wilkes Booth, John Surratt and David Herold. Alexander Gardner and assistant Timothy O’Sullivan’s grisly image Execution of the Conspirators, shot on July 7, 1865, shows men convicted of taking part in the assassination being hanged. Gardner, who left Brady’s studio in the fall of 1862 to start his own operation, captured or commissioned many of the most arresting and gruesome images of the war. O’Sullivan’s Field Where General Reynolds Fell, Gettysburg (July 1863), is an albumen silver print of six mutilated corpses, five in the foreground and one in the background spangled along the blasted earth. 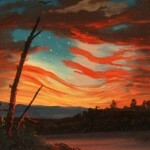 A complimentary major loan exhibition, “The Civil War and American Art” (also until September 2) will come to the Met after a stint at the Smithsonian American Art Museum. Organized by the Smithsonian, the show, with some 60 paintings created between 1852 and 1877, focuses on landscapes and genre scenes (artists of the time seem to have chosen to depict rather few battle scenes). A highlight is the presence of multiple canvases by Winslow Homer, who was a civilian artist-correspondent for Harper’s Weekly during the war. After visiting the Union front on multiple occasions, Homer created sketches that were published as wood engravings in Harper’s. Viewers of the exhibition will be able to view the oil paintings that Homer developed from those original sketches. Among them is the 1866 painting Prisoners from the Front, which depicts a tense staring contest between a Confederate prisoner and a Union officer. Painted in Homer’s typically rustic and muted palette, the painting seems to capture a rupture of humanity between the two sides—one bitter and destroyed, the other incapable of sympathizing. 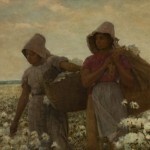 During the period that the exhibition covers, artists began to depict the plight of black Americans with a sensitivity that they hadn’t shown before. Eastman Johnson’s A Ride for Liberty—The Fugitive Slaves, March 2, 1862 (1862) shows, in a luminous, at-daybreak Impressionist style, a black family stealing away to freedom on horseback. Homer’s New Andersonville (1865–66) shows a young black woman soberly standing in the doorway of a dwelling, while in the top left corner Confederate troops can be seen marching by towards the Andersonville prison camp. 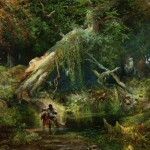 Thomas Moran’s Slave Hunt, Dismal Swamp, Virginia (1862) is a slightly glittery, almost fantastical painting that depicts a fugitive slave family trudging through swampy waters, pursued by dogs. The dire body language of the figures, who could neither go forward nor back to safety, is a metaphor for the slavery itself, the darkest mark on American history.